Please join us for a gathering of the ART Book Club. 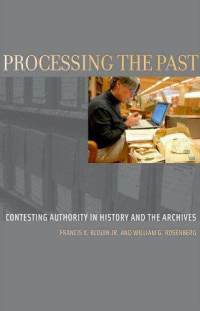 The group will convene on January 23, 2013 at 6pm at a location to be determined for an informal discussion of Francis X. Blouin Jr. and William G. Rosenberg’s book, Processing the Past: Contesting Authority in History and the Archives (Oxford, 2011). We ask that all participants commit to reading the book and come prepared with one or two questions for group discussion. The ART Discussion Group series is a periodic gathering of ART members to discuss issues of professional interest. All ART members are welcome. The Book Club grew out of a member's suggestion that books are a great way to initiate discussions around a theme. Participants to the Book Club will be capped at 15. The group is kept small to encourage discussion among all attendees. If you are interested in attending, please email us to save a spot: discussions@nycarchivists.org. We will email separately regarding the meeting location upon RSVP. Processing the Past has provoked significant debate amongst archivists and historians. ART Discussion Groups take on topics that address the immediate needs and interests of working archivists. The meetings are intended to create a space where archivists may engage in focused, informal conversation around specific problems derived from archival work, exploring strategies from everyday practice. Participants come away with fresh approaches to practical challenges. The size of each group is kept small to encourage all attendees to participate. When noted, sessions are designed for archivists at similar levels of experience. ART members themselves devise and lead the discussion groups. In order for the program to succeed, we need to hear from you! Please send in your ideas for future discussion topics. Or, even better, if you would like to lead a discussion, let us know. Send comments, questions and suggestions to Wendy Scheir and Maria LaCalle at discussions@nycarchivists.org.